JTB FlexReport 11.3 is released. There are a few bug fixes. See the version history for details. The upgrade is free of charge for customers with active maintenance. If the maintenance has expired please contact us to renew. 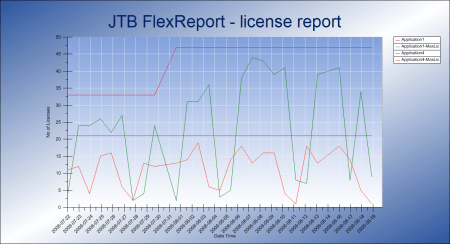 Free trial of JTB FlexReport is available. Do you wonder what JTB FlexReport is? JTB FlexReport is a license usage report tool for applications licensed using network license systems like FlexNet, IBM LUM, DSLS, SPLM, Sentinel, LM-X, RLM among others. Track usage over time, hours used and much more. If you have FlexNet licenses check out our JTB FlexReport LT freeware that has been updated to version 1.8. App for AutoCAD available.